Episode 41 features Swissmiss, AKA Tina Roth Eisenberg. 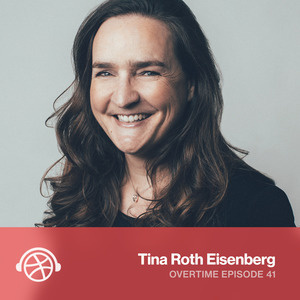 Tina is quite a powerhouse and is a super creative person who loves taking side projects and turning them into real companies that make a big impact in the design world. In the episode, Dan and Tina chat about finding your people, confidence vs enthusiasm, and injecting joy into your work. Tina also shares what makes Creative Mornings so magical and details about her new venture, The Creative Guild. "The one thing I’ve learned is that a community is not a community until it self-organizes. [...] Giving people the power and also reminding them of their responsibility to speak up when they see something that’s not right, really I feel like is the magic sauce for this." Transcript and more at Dribbble.com/Overtime.